My 22 month old daughter loves fruits very much instead of vegetables. So I love to give her all kinds of fruits. In every month I bake at least two cakes because my husband and my daughter love cake very much. Today I planned to make a nice cake but wanted to add something which I never added in cakes before. Few days before I saw a nice Fruit cake in one of my blogger friends Chitrangada’s page, and after that it’s difficult to resist. But instead of adding one fruit I added all the fresh summer fruits like Blueberry, Strawberry, Raspberry, Cherry. 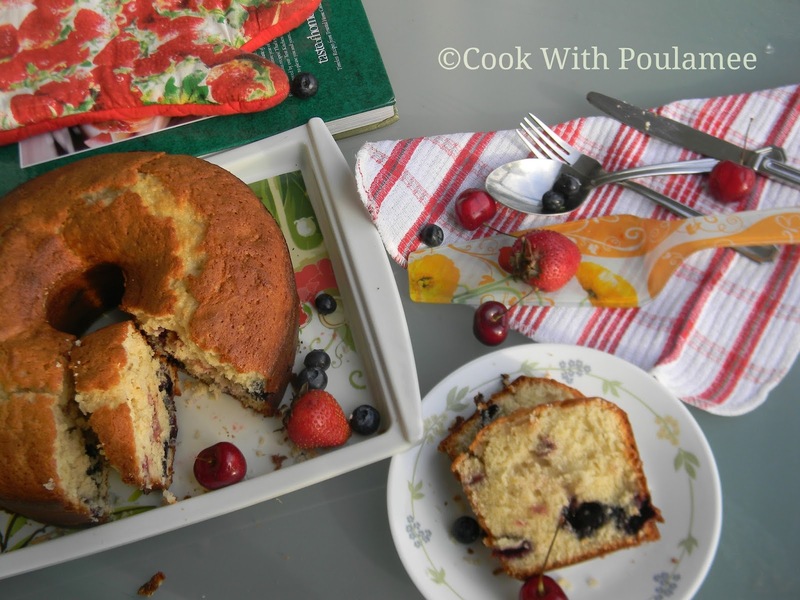 And with all the fresh fruits my cake turned out a super hit. With the smell of all fruits the cake becomes nice and melts in mouth. 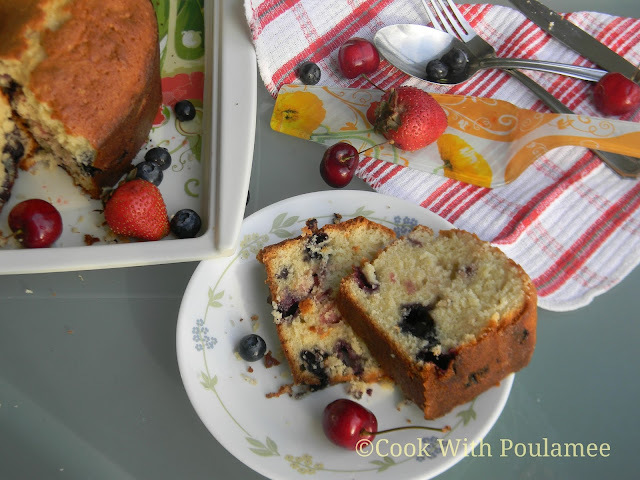 If you love berries then this cake is a perfect summer dessert for you. 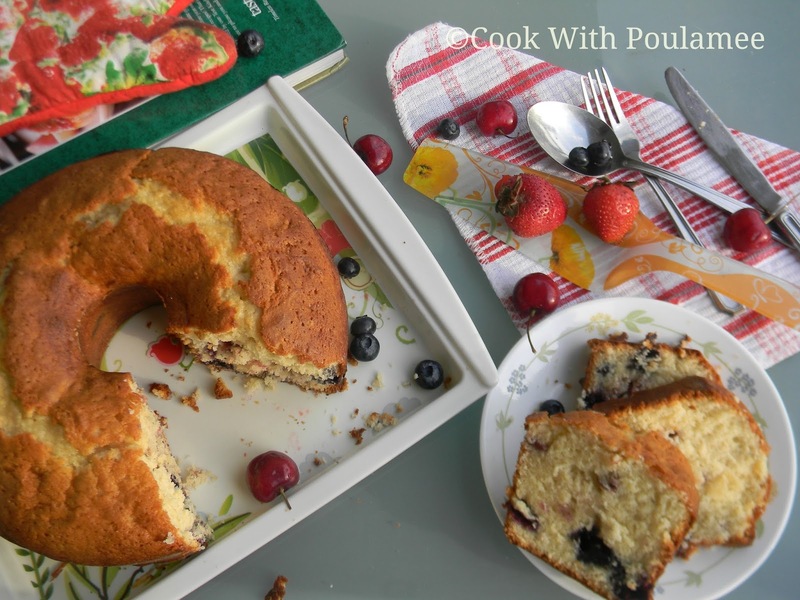 1.All purpose flour: 3 cup. 5.Baking powder: 1 tea spoon. 7.One table spoon sour cream. 8.One table spoon fruit essence. 9.Fresh Strawberry: 4 to 5 chopped. 10.Fresh blueberry’s: 15 to 18. 11.Fresh Raspberry: 8 to 10 chopped. 12.Fresh Seedless Cherry’s: 4 to 5 chopped. 14.Some extra butter and flour for greasing. Preheat the oven in 175 C.
In a big bowl add the sugar and butter mix till it light and fluffy about 5 mints. Now add eggs one at a time and beating well after each addition. Now add the sour cream and the fruit essence and mix well. In a separate bowl mix the flour, salt and baking powder nicely. Now slowly add the flour mixture into the creamed mixture alternately with milk. Beat just until combined. Now whisked the blueberries with some flour, and in a separate bowl add the chopped raspberries, chopped cherry’s, chopped strawberries. Sprinkle some flour into the chopped berries also. Now divide the cake mixture into two different bowls, and in one add the blueberry’s And add the chopped berries into the other bowl mix them slowly. 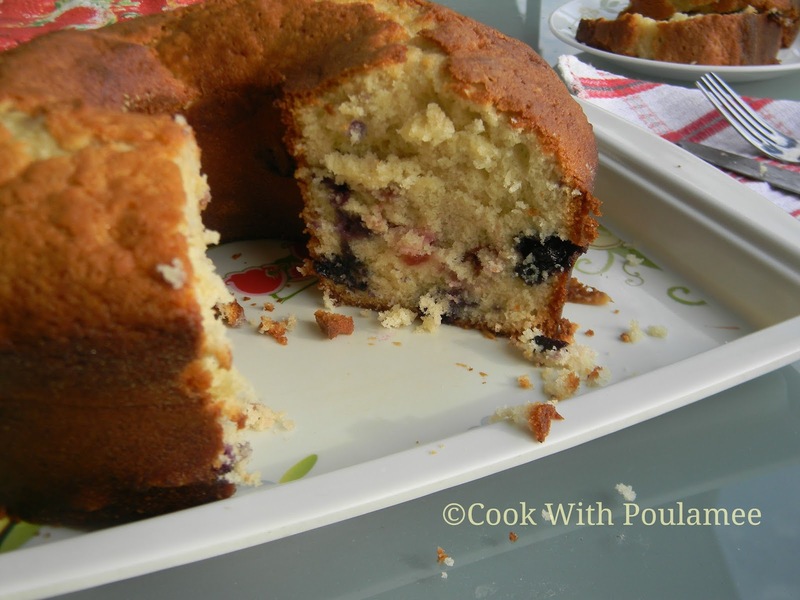 Now flour and grease one cake pan and pour blueberry’s mixture into the bottom of the pan, then add the other mixture in top of that. And bake it for 45 to 50 mints or until a toothpick inserted near the center comes out clean. 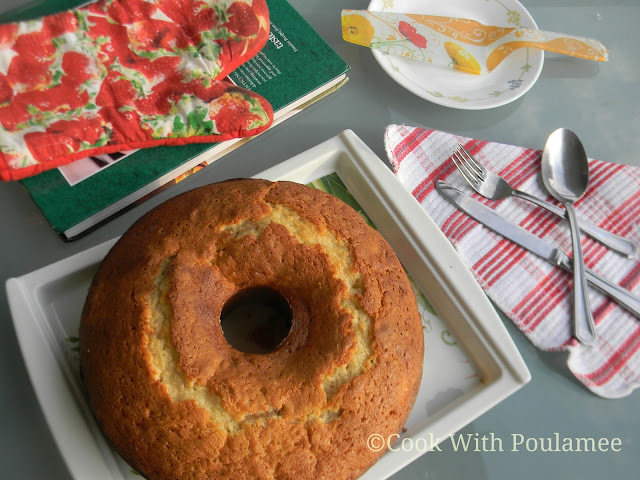 Cool it for 10 mints, then take out the cake form the pan and place it in a cool rack. Enjoy your oven fresh FRUIT CAKE with a cup of coffee. Tried this out yesterday and it turned out great. I didn't have any fresh berries on hand so I used some of my "rum fruit" left over from christmas in the equivalent volume. It was a big hit. I literally had to freeze piece of it so we would slow down our eating. what a wonderful feedback i am really speechless. thank u so so much dear.